The sun is out, sleeves are getting short, and that means: it's time to update your look for the season. We have created two easy DIY projects that will add a nautical touch to your wardrobe without breaking the bank or having to buy a boat. Learn how to make your own knotted bracelet and...come sail, uh, away? Bicycles get around by pedals, chains, gears, and wheels. Except, all the times that they don't, and they get around by being carried by their rider. Anyone who spends significant time on a bicycle can attest— on nearly every ride, there's a time when your bike gets lifted off the ground. Summer seems like the obvious hammock season, but I actually love to spend evenings outside during autumn. Sure, it gets dark early and it might be a bit chilly, but that's part of the fun. Today we'll show you another design that's just as easy and cool looking as our previous one. Grab a pair of scissors and some rope and follow along. I use extension cords on nearly all of my projects: powering tools in my outlet-starved basement workshops, plugging in task lights for fine handwork like cutting stencils or sewing, or snaking it through my kitchen to use outside for extra messy projects. And the rest of the time, my extension cords sit in a hopelessly bundled and tangled lump in a corner of my shop. A ManMade man is a resourceful man, and while we don't buy into the lone-ranger-ish, solely self-reliant masculine stereotypes, we do believe that classic skills always belong in one's repertoire. 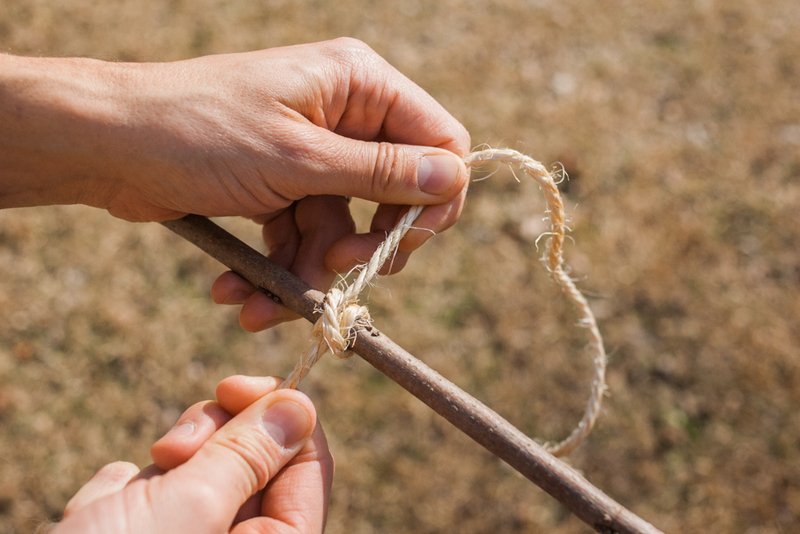 One such skill is tying effiecient knots, those that effectively and safely attach one thing to another, hold it still while you want it there, and then are easily released when you don't. The quick-tie bowline knot seems to be a perfect one to learn.